I love my MacBook Pro for many reasons, but one in particular is the Thunderbolt 3 ports. If you aren't familiar, Thunderbolt 3 is insanely fast at 40Gbps, but also, it is very versatile. It can transmit video and data, for instance, but also, it is compatible with USB-C devices too. By connecting a single Thunderbolt 3 cable to my Mac, I can simultaneously charge it and transform it into a desktop thanks to a docking station. Seriously, folks, TB3 is amazing. 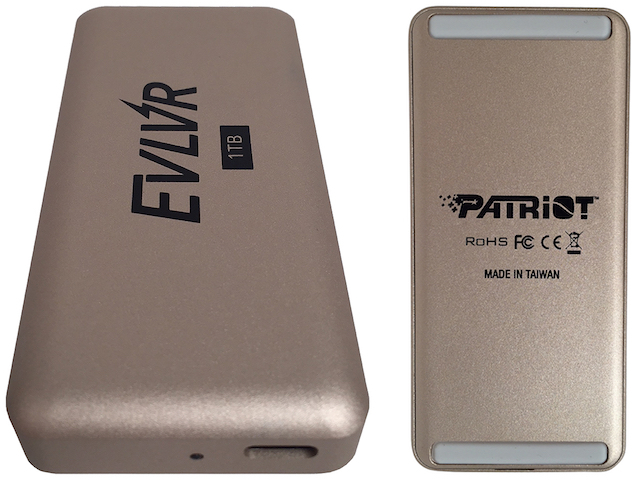 The company Patriot is leveraging Thunderbolt 3 for data storage, and its new EVLVR (pronounced "evolver") Portable SSD is blazing fast as a result. Not only is it very speedy, but it is physically small too -- a big win for portability. Despite being diminutive, it has big capacity -- up to 1TB of storage. Wow! "The EVLVR Thunderbolt 3 Portable SSD outpaces the speeds of traditional external SSDs by three-fold. With outstanding speed delivered by the Phison E8 PCIe controller and Thunderbolt 3 connectivity, the EVLVR can reach up to 1,500MB/s in sequential read and up to 1,000MB/s in sequential write speeds. On top of being extremely fast, the EVLVR is also power efficient and does not require any external power supply," says Patriot. What storage options will be available? 256GB ($200), 512GB ($290), and the previously mentioned 1TB ($490). Yeah, these drives are a bit pricey, but you are getting a lot for your money. The Evlvr is beautiful, fast, portable, and manufactured by a reputable company -- all the boxes are checked, y'all. All three capacities will be available starting March 2018.